? 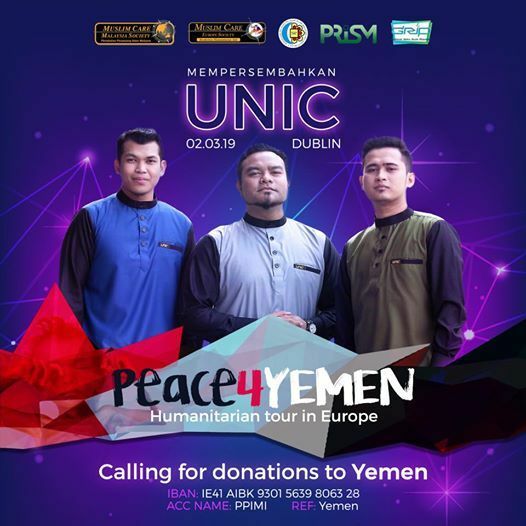 This 2nd of March, PPIMI is excited to host the popular nasyid group *UNIC* in Dublin! ? In collaboration with *Muslim Care Malaysia*, the tour is to engage Malaysians in Europe in fundraising the _Peace4Yemen_ humanitarian mission.
? More than 7 million children in Yemen are faced with severe famine as a result of a long-lasting armed conflict. We’ll also be hosting a few other _exciting events_ on the day ? - follow us on Facebook and Instagram to stay up to date!